New BMW 7 Series, with plug-in hybrid option, for April launch. 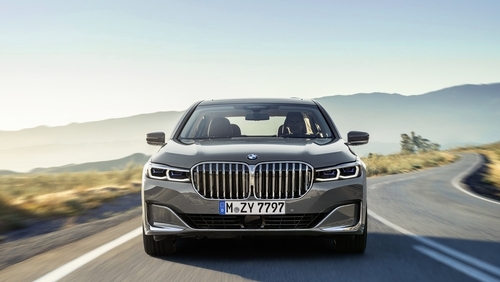 The grille on the new 7 Series is quite a statement. Big luxury cars may be sold in small numbers here but the market is still worth about €20 million. And BMW is now aiming to catch up with the Mercedes S-Class with its new 7 Series. The car now has a plug-in hybrid option. Perhaps it's the fact that BMW owns Rolls Royce that influenced the decision of the designers of the new 7 Series to look to their partners across the design corridor for the "face" of their new car. For the 7 Series now has a grille that would do justice to a Rolls Royce. The familiar and usually subtle kidney grille has now been made bigger, much bigger. About 40 per cent bigger, in fact. It's quite a statement and it looks like it might present an interesting challenge when it comes to competing with the 7 Series' arch-rival, the Mercedes S-Class. The S-Class has always had the edge when it comes to the race for the top between the two German manufacturers and their luxury offerings. And the grille on the new 7 Series is a quite a statement. Whether it's a statement too far for the rather conservative buyers of those €100,000 cars (give or take) is another question. Part of the reason for the bigger grille is that it accommodates an active air flap control with adjustable vanes that only open when the need for cooling air is increased. The headlights are also slimmer for this new profile. The new 7 Series now has a plug-in hybrid option. The 7 Series engine range now includes a new eight-cylinder engine and also features a six-cylinder unit with a plug-in hybrid system offering extended electric range up to 58kms, according to BMW. This system will allow the car to move about in city conditions on electric-only before reaching its range limit and then reverting to the petrol engine. Both the normal and longer variants of the car have grown by 22 millimetres in length over their respective predecessors, but there is no increase in height or width. The interior now has a LED ambient lighting with a choice of six colours. The car arrives in Ireland in April, with prices starting with a €96,160 price tag.